The cutest heavy assault weapon of them all. With Assault Android Cactus finally landing onto the PlayStation 4, I need some help. Can someone explain to me the frequency of combat droids resembling adorable little girls? Sure, you don't want your nefarious army composed entirely of hulking DeathBots like all the other mad scientists. But out of all the robot designs out there, why do we have to throw the cutesy ones into battle? 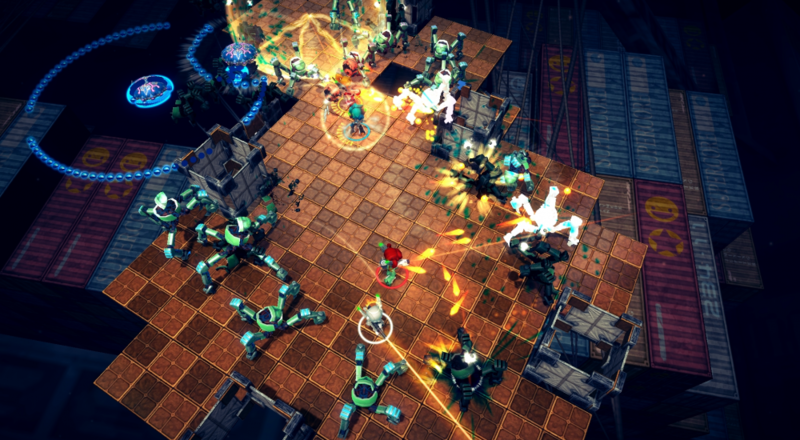 With Assault Android Cactus, you can even launch four at a time into robotic bullet hell. It's more of the Cactus you (and us, if our review is any indication) love, but for Sony's shiny current gen platform. You and three friends can team up to take on the forces of Robot Evil to collect battery packs so you don't die. It's kind of like the Streets of Rage equivalent of punching bad guys until turkeys fall out of them, but for robots. Maybe you and a buddy want to get your Assault Android Cactus on, but your friend happens to be bed-ridden with Jersey Fever, and you don't want to get anywhere near that. No problem! Just utilize the PS4 and the Vita's Cross Play functionality and you can team up without worry of contracting that particular illness. Truly, we live in the future. You can pick up Assault Android Cactus for a cool $14.99. Page created in 0.4115 seconds.